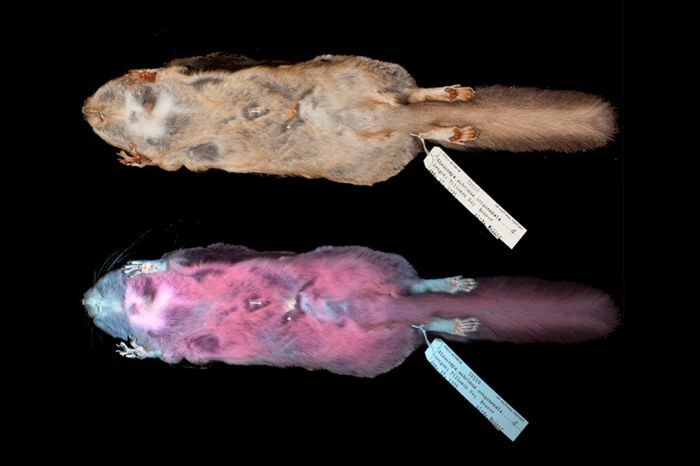 Allison Kohler, a graduate student in the Texas A&M University wildlife and fisheries department in College Station, helped make this discovery as well as affirm other flying squirrels do in fact fluoresce pink. More information can be found at http://bit.ly/FlyingPinkSquirrels. Kohler’s undergraduate professor Dr. Jon Martin, associate professor of forestry at Northland College in Wisconsin, was doing an exploratory forest survey with an ultraviolet flashlight in his backyard. Initially, he was looking at different lichens, mosses and plants to see what fluoresced. By chance, a flying squirrel happened to be at his bird feeder. When he saw it under the ultraviolet light, it was hot pink. A team to investigate this discovery was formed and included Martin, Kohler and two of Martin’s colleagues at Northland College: Dr. Paula Anich, associate professor of natural resources, and Dr. Erik Olson, assistant professor of natural resources. With access to a museum collection at the Minnesota Science Museum, Martin asked Kohler to take the lead on the project and develop a protocol to help further investigate exactly what it was they had found. In order to expand the search, the team went to the Field Museum of Natural History in Chicago and gathered more specimens. In all, they researched over 100 specimens ranging across numerous states, all confirming their “pink theory.” They also looked at five additional live specimens. “We tested all three of the North American flying squirrel species: the Northern flying squirrel, the Southern flying squirrel and the Humboldt’s flying squirrel, and all three of them fluoresced,” she said. After comparing the flying species to other squirrels, like the American red squirrel and gray squirrel, the team found that the pink color is unique to the flying squirrel. The reasons for the squirrels to fluoresce pink is still under investigation, but communication and camouflage are two top contenders for why this might be happening, the team has hypothesized. As the research develops, she said, the importance of this find will present itself more clearly. Kohler plans to continue her research while pursuing her master’s degree at Texas A&M. Further research will look firmly at the implications of the team’s find.